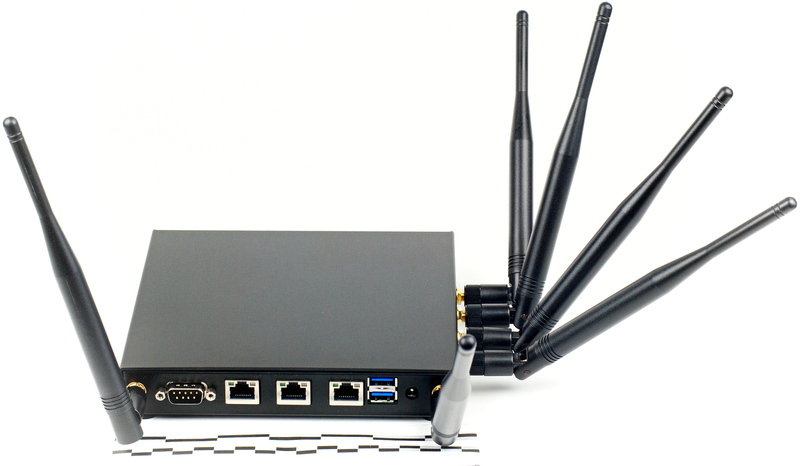 There are one ath10k a/b/g/n/ac and one ath9k a/b/g/n WiFi radios per CT521a-264-1ac-1n and multiple LANforge systems can be clustered together for even more realistic radio interference patterns and increased traffic generation capability. The CT521a-264-1ac-1n has no fans and is silent. It has 6 antenna. It will fit into a small travel bag or briefcase for easy portability. The system should be managed with the LANforge-GUI software installed on a laptop or PC. The CT521a-264-1ac-1n can also be managed over a serial console in text mode. Maximum throughput for the CT521a-264-1ac-1n is about 350Mbps and is bound by the relatively weak CPU. For faster systems, consider the CT522, CT523, and CT525 chassis. 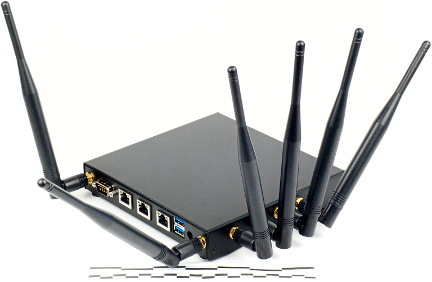 The Client side of the network will be the Virtual Stations configured on the CT521a-264-1ac-1n WiFi NIC(s). 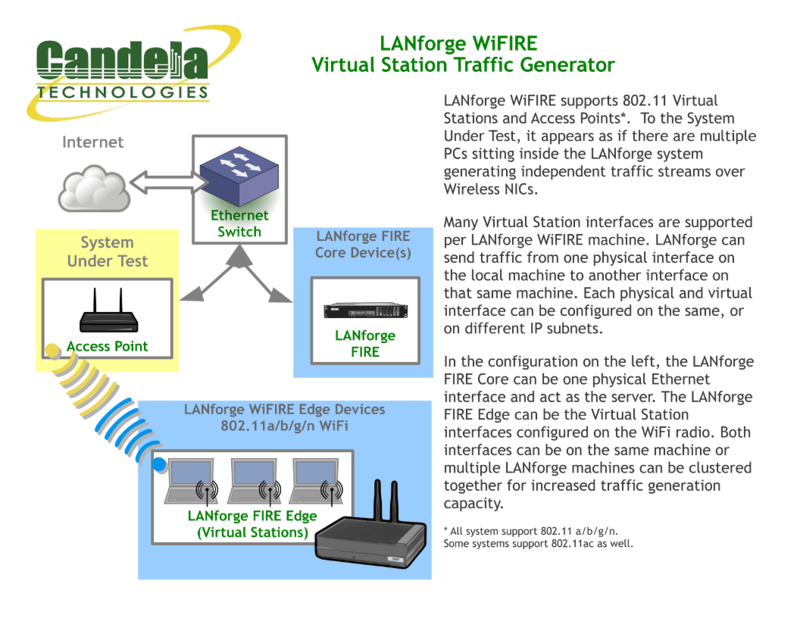 Install the LANforge-GUI on a separate management PC or Laptop. Windows and Linux GUIs are supported: Select the correct one from the CDROM or Candela Technologies Download page and install it. The CT521a-264-1ac-1n appliance has a web server that also provides the LANforge GUIs. The CT521a-264-1ac-1n should now boot. If DHCP is enabled on the Management network, the CT521a-264-1ac-1n will automatically acquire an IP address. If DHCP is not available, the IP address will be set to 192.168.1.101 by the LANforge scripts. Start the LANforge-GUI on the management PC and click the 'Discover' button. It should find the CT521a-264-1ac-1n appliance and add the IP address to the drop-down box in the Connect widget. Press 'Connect' and you will be connected to the CT521a-264-1ac-1n. Select the Port Mgr tab in the GUI. Double-click on the device called 'wiphy0'. This is the Radio device, and should be configured for the correct, channel, country-code, etc. Next, select one or more of the Virtual Station interfaces and click 'Modify'. Enter the correct IP address information, SSID and WPA/WPA2 password (if Enabled). After applying these changes, the Virtual Station interface should associate with the AP and be ready to send traffic. You may create up to 264 Virtual Station interfaces per CT521a-264-1ac-1n with the 'Create' button.